There are 2 ferry routes operating between La Palma and Tenerife offering you combined total of 23 sailings per week. Trasmediterranea operates 1 route, Santa Cruz de La Palma to Santa Cruz de Tenerife which runs 1 time weekly. Naviera Armas operates 1 route, Santa Cruz de La Palma to Los Cristianos which runs 6 times weekly. Fred Olsen Express operates 1 route, Santa Cruz de La Palma to Los Cristianos which runs 16 times weekly. As the frequency and duration of crossings on some routes varies we would advise that you do a live search for crossings from La Palma to Tenerife to get the most up to date information. 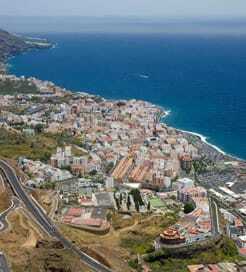 La Palma is the most north-westerly and fifth largest of the Canary Islands off the northwest African coast. It’s an island particularly well suited for walking holidays, offering hundreds of kilometres of footpaths through unspoilt areas of nature. You’ll be able to admire the mountains, volcanoes, beaches, rainforests and tiny villages along the way, too, which have all been declared a UNESCO Biosphere Reserve. What La Palma lacks in sandy beaches, it more than makes up for in breathtaking views of forested valleys and fascinating rock formations, earning it the nickname ‘the jewel of the Canary Islands’. La Palma’s main port is in Santa Cruz de la Palma on the east coast, where you can sail to most of the Canary Islands and mainland Spain, so there’s plenty of options when it comes to travelling by ferry. The island of Tenerife is the largest and best known of the Canaries group with a coastline of some three hundred and fifty kilometres and attracts over ten million visitors to its shores each year. 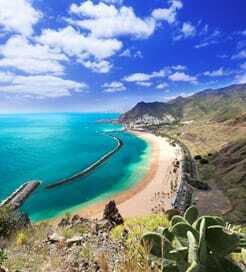 The number one reason that people head to Tenerife is because of the year round guarantee of sunshine, making the island of Tenerife a top winter destination. Weather and amazing beaches aside, Tenerife has so much more to offer, with ravines, as well as spectacular cliffs, forests, and even fossilised remains of prehistoric animals. Tenerife will no doubt offer a unique experience for every visitor. Perhaps due to its size and undoubted popularity, getting to Tenerife by ferry is relatively simple with numerous choices on offer. With two principle ferry ports, whether you are coming from the mainland (on a long crossing) or island hoping from another canary island, most of the region’s most popular ferry companies call at Tenerife.